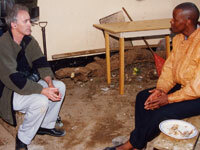 Producer Mark Kaplan spent seven years documenting the lives of Joyce and Sikhumbuzo Mtimkulu, mother and son of the murdered young man, culminating in a meeting of the family with Siphiwo's killer, Gideon Nieuwoudt, a former colonel in the apartheid government's hated security police. Kaplan reveals the fragility of South Africa's transition to democracy by exploring the feelings of the Mtimkulu family. The film picks up where the hearings of the Truth and Reconciliation Commission left off. It offers a deeper understanding of the difficulty of reconciling with torturers, knowing they will receive no punishment. A burial of the only physical remains of Siphiwo - a handful of his hair - is a pitiful closure. For Siphiwo's son, Sikhumbuzo, this may not be enough. Note: This is an updated, and much more detailed, version of an earlier film called Where Truth Lies. "Skillfully combines material from a wide array of sources... A powerful look at the long, difficult process of healing for the Mtimkulu family and for South Africa, this is highly recommended." "Constructed with honesty and beautifully photographed. But it is history that makes it what it is. These extraordinary circumstances remind one how far we've come and how far we have to go." "This film does what the hearings of the Truth and Reconciliation Commission did not. It offers a deeper understanding of how truth and reconciliation matter on a personal level, whether reconciliation ever took place, whether it can take place...This film helps us to understand how big a sacrifice is being made by a generation, forgoing not only revenge but the satisfaction of even the most superficial punitive justice." "Moving...It explores...the need to bury the past and live in peace with citizens of all races and ethnic backgrounds."